 ``Why is it that nobody understands me and everybody likes me?'' Albert Einstein reportedly asked the New York Times in 1944. In this new collection of 11 essays on Einstein's life, physicist Pais responds, ``It is neither true that no one understands Einstein nor that everyone likes him.'' Pais speaks from a position of authority: He was a friend of Einstein's and wrote the highly acclaimed 1982 Einstein biography Subtle Is the Lord.... Whereas that volume focused on Einstein's scientific achievements and contained a plethora of equations incomprehensible to the layperson, this companion volume primarily illuminates Einstein's relationship with people both inside and outside the scientific community. For example, the reader catches several of Einstein's high-powered conversations with the great Danish physicist Niels Bohr about the implications of quantum mechanics, and a fleeting yet fascinating debate concerning the nature of truth with Indian poet Rabindranath Tagore. 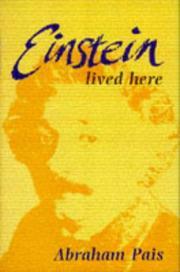 In the concluding essays Pais generally allows Einstein to recount in his own words (through excerpts from his writings, speeches, and interviews) his views on religion, philosophy, and politics. We learn how Einstein used his worldwide fame to disseminate his views on pacifism and supranationalism through the media (views that provoked anti-Semitic reactions and charges of Communist leanings from right-wingers). Along the way, Pais sheds new light on some of the controversies surrounding this intellectual giant. For instance, Pais lays to rest the claim that Einstein's first wife, Mileva Mari, played a significant creative role in the development of special relativity. Pais also explains how Einstein's scientific mind-set prevented him from accepting the indeterminate nature of quantum mechanics--even though he called it ``the most successful physical theory of our period.'' There is considerable repetition from essay to essay and despite the author's best intentions, much of the scientific discussion will lie beyond the grasp of the lay reader. Those seeking a broad overview of Einstein's life will be better served elsewhere.